How we helped the EAA attract new members with mind-blowing 360 videos. 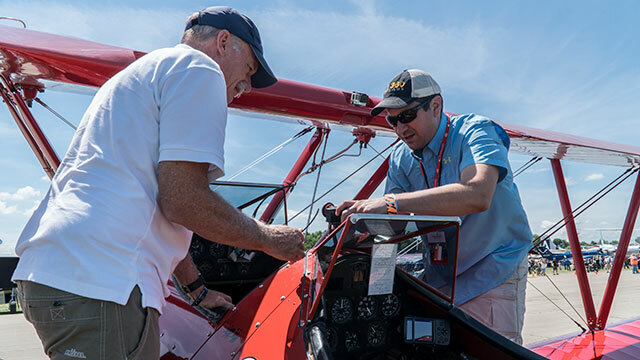 The Experimental Aircraft Association is a thriving aviation community with a goal to promote and support recreational flying with over 200,000 members worldwide. EAA came to 360 Labs with a need to create exciting and engaging 360 VR video content to bring the association’s mission and purpose on the road to tradeshows and events. As a two-part project, EAA first asked 360 Labs to create a guided 360 video virtual tour of the EAA Museum at their headquarters in Oshkosh, WI. Later, we would create thrilling 360 video content with a 5 day production at AirVenture Oshkosh, an air show and one of the biggest gatherings of aviation enthusiasts in the world with more than 550,000 in attendance in 2016 and more than 10,000 aircraft. Although the air show was really the more exciting of the two concepts, we knew the museum had a compelling story to tell with an incredible history. To keep viewers engaged and interested, we captured several dynamic shots with our ROVR dolly system and cable cams. We also worked with a drone pilot, an EAA member himself, to fly the grounds and give folks a bird’s eye 360 view of the building. “We had a lot of information to convey in a short amount of time but didn’t want the piece to be convoluted, confusing or visually boring,” Tricia Rathermel, EAA’s Tradeshow Marketing Manager explained. To keep things interesting, EAA brought in aerobatic national champion aviator Mike Goulian to be on camera and give the guided tour. Hosting a 360 video can be difficult considering you are often speaking all of your lines in long takes while looking at a camera on an empty set with no one to guide you. To help with this, we set up a teleprompter at the base of the camera. Goulian was able to focus on explaining the history of the museum without distractions. Two months later, the team returned to capture AirVenture. Compared to the Museum project, this was a live ongoing event. The crew had to stay on our toes and capture as much as possible in 5 days of production time. In all total we had over 2 terabytes of media captured on a mixture of 7 different camera configurations. Going into it, we weren’t sure exactly where we would be allowed access, so we brought a variety of different rigs and configurations. As a result we were able to capture shots on the ground, on aerobatic stunt planes, in a helicopter, on powered parachutes, and even dumped 7,200 gallons of water from a Martin Mars near one of our cameras. AirVenture definitely required our crew to divide and conquer. To maximize our time on location, we had several cameras covering different aspects of the event simultaneously. We worked very closely with AirVenture staff to anticipate the schedule and put our cameras in the best possible locations to capture the excitement. EAA shows the finished 360 videos in Samsung Gear VR headsets on the road as part of a mobile marketing unit, an EAA branded semi truck and trailer featuring 3 VR viewing stations. Fans who are interested in seeing it again can download an interactive 360 video app on Android, iOS, and the Oculus Gear VR store. Videos in the apps contain scenes not included in the shorter tradeshow edits. The apps were built on the Liquid Cinema platform, which allows for unique control over the orientation of each new scene. With forced perspective, we can reorient each 360 shot on the hard cut to ensure the viewer is seeing the opening view we want them to see, without them even noticing anything has changed. “There are so many aspects to aviation that are not available to active aviators nonetheless the general public. Virtual reality and 360 video have given us the opportunity to put the viewer where they never have been before – the cockpit of an aerobatic plane, under a 30 ton water drop and in the heart of the World’s Largest Aviation Celebration!” - Tricia Rathermel, Tradeshow Marketing Manager, EAA.